"We won't make them leave straight-away. The ones that score the most points might not even have to leave." Answer given on a BBC Radio show today (talking about EU nationals currently living in the UK, post Brexit result). Since when was that ever in the debate, anyway? Hello, I'm English but I live in Estonia (a thriving EU nation, if not with its own unique regional challenges). I voted in the recent UK referendum on the issue of whether the UK should remain or leave the European Union. I traveled back for a family celebration on the day after the result was declared - last Friday. I was still in shock. Still am actually. On Saturday morning I went to a local play-ground in Oxford. There were lots of people, families, out enjoying the day, their kids playing. I was with my two daughters. We've lived in both Russia, and now Estonia, for the last eight years. In the past, whenever we've traveled back to the UK, I've often made use of the other languages we've picked up. Sometimes for the novelty of it, mainly to be able to communicate something to our girls whilst out in public that I don't necessarily need others to hear. It's (usually) our secret language! This last Saturday the same thought crossed my mind. Even as the Estonian words were forming in my head, this time I caught myself. And this is why I'm writing this article. You see, the caution that crossed my mind was this - I don't know anymore from those around me whether I'd be as accepted if I spoke anything other than English. This thought greatly troubled me. There I was, as English as anyone can be, tall and male (so least likely to be physically threatened by any would-be aggressor) and I no longer felt it was acceptable to speak a European language to my children in a public park in England. - I'm not suggesting that everyone who voted LEAVE was basing their decision on racist and/or xenophobic viewpoints. - I'm not saying that I was threatened in any way or that people living in Oxford (or anywhere) are all hostile towards outsiders. I'm merely saying, because of the result, that an element of doubt was now in my mind. And in that moment I felt what all visitors, especially EU citizens (many living and serving this nation for a long time already) must now feel. And that is a really sad revelation. 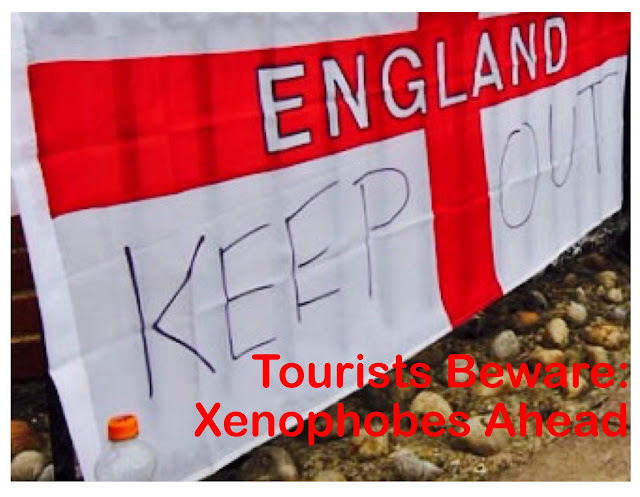 Now whilst I state that the LEAVE vote wasn't solely based along xenophobic lines, there has sadly been a very vocal element of this voice rising up since the result - foreigners being told by 'locals' to leave the country. The news, social media and papers are growing on a daily basis with accounts of this type of anti-social (and criminal) behaviour. And even just days after the actual result, it is clear that everything promised on a successful LEAVE vote is far from a given - the NHS lie is maybe one of the biggest. There are also large numbers of LEAVE voters (presumably unaware of how voting actually works, or just playing with what they thought was a harmless protest vote) that are now voicing they'd not have voted that way if they'd known, or at least now showing doubts upon their decision. - The Pound crashing in value (as well as the UK markets). - Both main political parties in a state of free fall, their leaders doomed. - Both Scotland and Northern Ireland very likely to vote for their own independence, therefore breaking up the UK. Either of these breaking away causes a huge issue with what becomes of the borders after that. They'd have to be secured to keep people out. - It's clear that the EU isn't going to roll over and make it easy (why should they when we've been the ones to ruin the relationship?) There are therefore no guarantees at all when it comes to any type of business trade deals. These are just some of the issues. Clearly the strongest issue is the fact that the xenophobes now feel they have a legal right to abuse anyone they deem as unworthy of staying here. Is that what you voted for? Again, I'm not saying anywhere near the majority of those 51.9% who voted LEAVE were doing so on racist grounds - but from what can be seen, the number that share some element of that view would be a significant percentage. And let me be clear - if you were putting everyone on a xenophobic scale, 0 being no issue whatsoever and 10 being outright racist, there is no gradient. Another from 1 up to 10 is already xenophobia. So even if that number was as little as 30% of voters, that's 3 people in every 20 (lets assume its a 50/50 split for IN or OUT, then 30% of those 10 LEAVE voters makes 3 people). Standing in that playground on Saturday, with a lot more than 20 people around, statistically, I wasn't going to take that risk. Of course the referendum was just something to take the nations pulse, so to speak, on the issue of EU involvement. It has no legal power to take us out of the Union, and as the days go on, you can see the full weight of making that call taking its toll. No one wants to be that person. The whole debate, vote and now result, of course, was completely wrong to put the nation through in the first place. The UK should never have been put in such a position. Is all hope lost? I don't believe so. There are growing calls for a new referendum. I'd go along that. If you now knew all you do in the days after the result (and seen these xenophobic attacks) would you still have voted LEAVE? I'm not saying you need to carry on as before. I just believe the vast majority would look at what has happened - as if the curtain has been pulled back and light shed on all those 'promises' that the LEAVE campaign made - and suddenly you aren't now so certain. Sadly, once this action gets formalised, there will be no going back. There is time to stop this. Let your voice be heard. Stand up for what you want the UK to really be. Don't let the thugs win. We aren't a nation of xenophobes, are we? And if the UK does leave the EU? The vast majority of younger people wanted to be a part of the EU - so I'd say leave, travel into Europe, get work there, enjoy life in the common market. Visit places. There are many places calling out for people to come to them - Estonia being one of them. It's an amazing country, and an amazing experience. You all do have a choice.